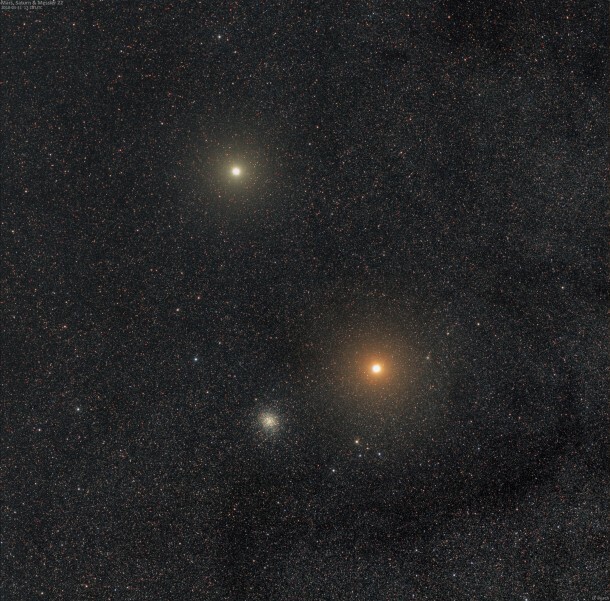 Wandering through the constellation Sagittarius, bright planets Mars and Saturn appeared together in early morning skies over the last weeks. They are captured in this 3 degree wide field-of-view from March 31 in a close celestial triangle with large globular star cluster Messier 22. Of course M22 (bottom left) is about 10,000 light-years distant, a massive ball of over 100,000 stars much older than our Sun. Pale yellow and shining by reflected sunlight, Saturn (on top) is about 82 light-minutes away. Look carefully and you can spot large moon Titan as a pinpoint of light at about the 5 o’clock position in the glare of Saturn’s overexposed disk. Slightly brighter and redder Mars is 9 light-minutes distant. While both planets are moving on toward upcoming oppositions, by July Mars will become much brighter still, with good telescopic views near its 2018 opposition a mere 3.2 light-minutes from planet Earth.